In February, Brisbane’s newest contemporary world music artist, Zannah (Susanna O’Leary), debuted with her evocative single, ‘Twisted And Wild’. Zannah is now releasing a stunning showcase of her vocal prowess in her 7-track debut EP, ‘The Promised Land’ (out April 6). The release of the dynamic single, ‘Twisted And Wild’, was a true unleashing of Zannah’s vocal capabilities and diversity. This explosive and intense number opens with a slow build with the tabla-drums and then incorporates distorted guitar, high-powered drums and a huge string-section, all of which builds towards a dramatic close. Although the single displayed a wide spectrum of Zannah’s eclectic style that delves through pop, rock, Latin, folk and jazz, she has so much more to offer with this debut EP. Zannah’s music travels across the world with a touch of Spanish flamenco guitar in tracks ‘No Fue Amor’ and ‘Bonita’, both sung in Spanish. She then spends a little time in Ireland with the inclusion of the Celtic Bodhran – Irish traditional frame drum – and her Celtic influenced vocal stylings in ‘Ashes’ and ‘Remember Me’. Lastly, of course, the Persian – otherwise known as Iranian traditional music – vocal techniques and influences feature on the opening track ‘It’s Said And Done’, ‘Twisted And Wild’ and ‘Exiled’. From the romantic slow burner of ‘No Fue Amor’ to the fiery cries and chants in the richly layered anthemic track ‘Remember Me’ there is an alluring blend of non-western styles and instrumentation with traditional western instrumentations and styles that makes this debut EP a highly dynamic, forward-looking and valiant take on the contemporary world-music genre. Overall this sophisticated, passionate and highly-polished EP is undoubtedly a broad assortment of everything that makes up Zannah’s syncretic music style – one that is built upon her adorations in life, love, family and her refreshing outlook on contemporary world music. 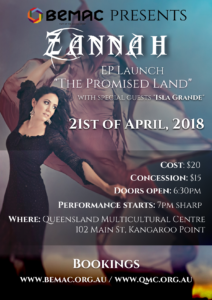 Join Zannah in celebrating the release of her EP at QMC on April 21 with support from Isla Grande.